← Vote Straight Ticket Democrat. Do It Now. One thing that all good political organizers know is that you never, ever celebrate until the polls are closed and ALL of the votes are counted. Yet I’ve been seeing a lot of Democrats breaking out their victory dances, long before Election Day. They need to cut it out. NOW. It pains me to say it, but Donald Trump is still a very dangerous candidate. His voters are extremely motivated and passionate, and he is still holding on to a lead in some crucial swing states like Ohio. I made my new movie, “Michael Moore in TrumpLand,” because I believe that Democrats can’t rest until Trump is GONE — completely, utterly and totally defeated in the kind of landslide that Republicans will be having nightmares about for decades. But this election isn’t just about Trump (even if Trump is still the worst.) It’s about Congress. It’s about flipping the Senate, and making previously unimaginable gains in the House and in state governments everywhere. It’s about Senate Budget Committee Chairman Bernie freaking Sanders. If we get out the progressive vote in this crazy election, we can put Bernie in power and build the kind of progressive majority we need to make the policies behind the political revolution a reality. But that is going to take a lot of work in the next  days. That’s why I’m asking you to support DFA’s relentless work to maximize progressive turnout in key states. With 10 days left, and final budget decisions being made right now, my friends at Democracy for America need your help urgently. Please chip in $3 or more today to help DFA expand its 96-hour GOTV program, get progressives to the polls, flip the Senate — and give Bernie the gavel. Here’s the thing about Donald Trump: He has absolutely electrified his followers, but he has also scrambled the electoral map in a way that few political pundits saw coming. That means that on Election Day, literally anything could happen. Trump and his merry band of corrupt GOP followers could eke out a horrifying come-from-behind victory. OR, we could see a progressive wave that sweeps the nation — one that puts our greatest policy dreams within our reach. Close elections are always, always, ALWAYS won in the field. That’s why the work DFA is doing right now matters so much. DFA members are killing it on the phones and on the doors in states like North Carolina and Nevada, where the results of races that are currently neck-and-neck will determine which party will lead the Senate in 2017. 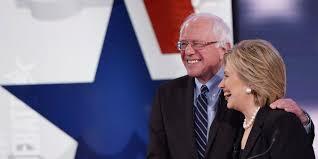 Want to see Bernie Sanders and Elizabeth Warren running the show in the most progressive Senate ever? Then pitch in $3 — or whatever you can afford — to help DFA expand programs like Political Revolution in My Backyard and DFA Dialer in these final pivotal days. Thanks for staying engaged in this important election — and for supporting DFA! P.S. If you’re still sitting on the sidelines or don’t feel excited by politics this year — or if you just need a laugh! — you should check out my new film. Click here to find a theater near you that is playing “Michael Moore in TrumpLand” or, if you can’t find a local theater that is playing it, you can download it at iTunes.com/Trumpland or get it on Amazon right now! Hope you like it — and spread the word! Help DFA expand its GOTV program. Click to donate. Thanks for all you do! This entry was posted in 2016 Election Campaign and tagged Bernie Sanders, DFA, Hillary Clinton 2016, Michael Moore, Trumpland. Bookmark the permalink.